So, you’re in the real estate PPC advertising game. You’ve had your fair share of ups and downs in the real estate market and you stuck out the last few years. Now you’re putting money into generating your own leads through AdWords and you need some help getting started, or getting to the next level. Here is a 3-step guide that will lead you to success whether your goal is getting leads for potential buyers or sellers. It’s not always easy or cheap, but I’ll show you strategies we’ve had success with! The first thing you need to realize is that doing real estate PPC can be broken down into three parts. The first is your strategy for driving traffic, the second is the platform you use to turn that traffic into leads you can follow up with, and third is actually following up. All three are equally important. The second thing you should know is that different geographical areas will have different levels of competition, and different buyer wants and needs. A strategy for New York City will be very different than for rural Alabama. With that said, these three pillars of real estate PPC success should generally hold true for most real estate advertisers. Any good real estate PPC campaign starts with getting to know your market. Know the areas you want to target, the types of homes you want to sell, and the type of buyers/sellers you want to work with. Use that info as the starting point for your keyword research. If the area you’re targeting is big enough, I like to have a campaign that targets the major metropolitan area and break the suburbs out into their own campaigns. I’d also target keywords for specific neighborhoods, especially ones that have high margins in your area. Then we can have city and neighborhood specific budgets and track returns/leads at the same level. I know these don’t look fancy, but it usually works! You’ll also find exact match keywords that work great for long-tail keywords, usually for very specific locations. Getting the right traffic is important, but if you can’t get leads, then you’re paying for eyeballs on your site and nothing else. Defining conversions in your real estate PPC campaigns is pretty critical, and hopefully you aren’t expecting to turn PPC on and start selling homes that day. You need to capture the leads, follow up on them, and keep a consistent lead flow for long-term success. There are a number of platforms that can integrate with MLS listings and create custom search/landing pages, such as Kunversion, which manages listings and captures leads. 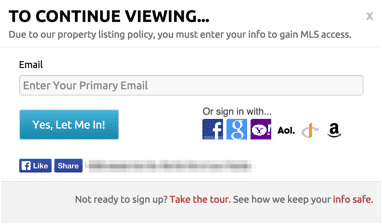 The most effective real estate lead platforms often create a popup that appears after a visitor has viewed a few home listings, asking for an email address before the user can continue browsing. This sort of popup lets you build a substantial email marketing list. We’ve seen conversions from leads into sold homes range anywhere from 1-3% in some areas. How do you follow-up on these leads in a way that doesn’t overburden them, but still is proactive and provides results? That’s a good question that you should be thinking about from day 1! I’m not a real estate agent, and I’m not going to assume to know your job better than you, but I will tell you this: if you’re paying for leads through AdWords, you’ll want to have a good system for following up on leads before you start running ads. Know the areas you want to target, & the type of buyers/sellers you want to work with. I would recommend an email drip campaign that pushes for an appointment to discuss home buying/selling needs in person or over the phone. If you work with other agents be sure there’s a clear system for who’s going to contact leads and how quickly it needs to happen. If you’re in real estate and you know how to close a deal, then this is a great way to increase your opportunity pipeline. I’d love to hear your success stories with using paid search to drive real estate leads. Let us know in the comments what you’ve done! Thanks for the comment David. I don’t have a ton of knowledge in this area because our focus is primarily on the paid search side of things. That being said, here are a couple that I’ve worked with that make the paid search side much simpler and more effective. Hi Andrew, I currently have a proagentwebsite but I am not getting any leads with my site. I am doing PPC myself but I have no idea what I’m doing. I guess I am wasting my money month after month. Can you help me make sure that my Proagent website is SEO optimized and matching my google adword express PPC so I’d get leads, please please please……..If you can teach me how to do it, that would be great too. I wanted to know basics for optimization of real estate PPC campaigns and targeting methods . I’d be happy to help with that. Can you explain in an email what you’re looking to learn exactly? I’ll get back to you directly, thanks! Hi Andrew, I currently have a proagentwebsite but have nit been dong PPC. I am going to start, and will be looking for a good PPC manager. I’ve done it myself in the past enough to realize that for it to be done right I need to hire someone so that I can focus on follow-up as opposed to generation. I am thinking about getting a real geeks site to replace my proagent site. Do you have any familiarity with the real geeks sites? Andrew, I just started a professionally managed ppc campaign. A click brings the visitor directly to the lead form as opposed to to viewing a page of homes, but most sites I see bring the visitor to a homes page first then after clicking on a home they get the lead page. Great article thanks for sharing! Will use it on our Calgary Real Estate website!